Posted on August 5, 2015 at 4:48 am. If you’re looking for more ways to win on the pokies without having to hand over as much of your hard earned cash, head to Slots Million this week to get in on the huge free spins offer, giving you the chance to scoop up 100 free spins every day of the promotional period. That’s 700 free spins that could be yours, just by playing some of the world’s best online slot games. The promotion is running from the 3rd of August to the 9th of August, so with only a few days left before the offer expires, it’s time to get cracking. How do you win these free spins? All you need to do is play any of the selected 45 Net Entertainment pokies games at SlotsMillion.com via our links for real money bets. For every 1,000 spins you place on any of these NetEnt titles during a 24 hour period, your account will automatically be credited with 100 free spins which can then be used on the same 45 specified NetEnt games. 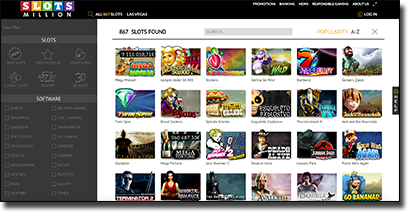 You can also use Slots Million’s helpful search toolbar to locate NetEnt games, just click on the magnifying glass icon at the top of the home page, select ‘NetEnt’ under the software category and the list of all games from Net Entertainment will come up. There’s over 90 NetEnt pokies at Slots Million, so be sure to check within your game lobby to be certain you’re playing one of the specified games to earn the free spins. NetEnt is one of the world’s leaders in online pokies software. Their games are among the most vibrant, visually advanced and innovative slot games you’ll find anywhere on the Web so you’ll have no problem finding a game from this list worthy of your 1,000 spins a day. Your only real problem will be choosing which ones to play, as each is more outstanding than the last. Whether it’ll be chasing crazed farm yard animals across the reels as they get sucked into a tornado in Tornado Farm Escape, unleashing the bat bonus within the chilling Dracula or cracking open the kooky piñata creatures to reveal their sweet insides in the Mexican themed Spiñata Grande, NetEnt truly do offer something for everyone, catering to a huge range of themes and pokies formats. If you’re not a member at Slots Million yet, follow our links to sign up for a new account and you’ll also receive two times your initial deposit up to a value of $100 when first loading funds to your account. Not only that, you’ll also receive up to 100 free spins just for making a deposit, with welcome free spins available on Gonzo’s Quest, Twin Spin, Jack and the Beanstalk, Spiñata Grande and Fruit Shop. Slots Million is one of the Internet’s most comprehensive pokies sites, offering over 867 slot games from the best developers in the bizz including Microgaming, Thunderkick, iSoftBet, Rabcat, Next Gen Gaming, Playtech and many others. The site is fully protected by SSL digital security encryption and offers a range of deposit options in AUD like Visa, MasterCard, Skrill, Neteller, UKash and Paysafecard. Don’t let these free spins pass you by, head on over to Slots Million now to get more chances to win big on the pokies with every spin you make.